There’s a few new products in the Stop The Wave shop I wanted to let everyone know about. 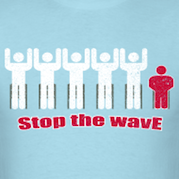 Before I get to those, just a reminder that if you want one of the original Stop The Wave logo t-shirts you can order directly from me by either hitting the Store button in the top right of the screen or by clicking here. First up are the Stop The Wave logo t-shirts in more team colors. Those pictured below aren’t the only new colors and there should be an option that fits your team. If there’s not let me know and I’ll try to get it added. I recently received an email from Lincoln, a former Nebraska student who wrote an article about why the wave needs to end back in 2002 for the Daily Nebraskan. He’s talking about wanting to see the wave gone at Nebraska football games but it right on about why the wave needs to go. While I am sure being able to have “Creator of the Wave” inscribed on their tombstone is important to these men, this honor ranks just below owning Luis Gonzalez’s chewed bubble gum. No matter who started the wave, it has spread and grown in popularity since the early ’80s. The time has come to end to the wave. Be sure to check out the rest of the article, it’s a good read. This past Wednesday the Los Angeles Times ran an article by David Wharton about the stop the wave movement at the Ballpark. In the article Wharton describes perfectly one of my main problems with the wave. It isn’t like the all those USC alumni flashing the victory sign when the band plays “Tribute to Troy.” It isn’t like the cowbells at Mississippi State or “the chop,” in either its Atlanta Braves or Florida State incarnations. Those traditions are connected to the action on the field. Those fans can make the argument they are rooting for their team. The wave exists independent of home runs or touchdowns. It can be roaring along at the exact moment that misfortune befalls the home team — sometimes the crowd abruptly stops cheering, sometimes it doesn’t even notice. That puts the wave in a subcategory with beach balls in the stands at Dodger Stadium or droning vuvuzelas, the South African horns that made the 2010 World Cup sound as if it were played inside an enormous bee hive. The Rangers and Mariners were playing a game Wednesday that was tied 3-3 in the seventh inning. After the Mariners scored the go-ahead run a wave started going around the Ballpark. The Mariners were now up by a run and still had men on first and second with one out. But those people doing the wave didn’t care what was going on, they just had to entertain themselves. That is what Wharton meant, the wave had nothing to do with the game at the point. What did it matter that the Rangers were trying to win an important game? As long as those doing the wave could stand up in unison every minute or so, they were happy. There’s a long way to go to get the people doing the wave in the seventh inning of a close game to understand why it’s a bad idea. Hopefully the attention the movement’s received over the last couple of weeks and signs like those that are displayed at the Ballpark can help them out. I was sent a link to an article on A.V. Club Milwaukee by Steven Hyden about what he thinks about the wave. The article is almost two years old and I’m sorry I hadn’t seen it before because it’s right on the spot. I am a vehement anti-wave sports fan. In fact, I think it’s a shame that “vehement anti-wave sports fan” isn’t redundant, because all real sports fans should shun the wave like they do Pete Rose, Tonya Harding, and people that complain about soccer not being more popular in the U.S. The wave is stupid, highly annoying, consistently ill timed during game-time moments, and—have I mentioned this yet?—just really [effing] stupid. It’s the Macarena of audience participation activities—only people didn’t get sick of doing it after six months. Make sure to check out the rest of the article. And speaking of A.V. Club, we had a brief mention on their Austin site. Hint, it’s not very often. Dale Murphy is my all-time favorite player, so when he starts talking about the wave on Twitter I’m definitely going to listen. Someone asked him to respond to today’s Los Angeles Times article about the stop the wave movement, more on that later, and he did. So there we go, that should be enough. If Dale Murphy says it’s time to get rid of the wave, then it’s time to get rid of the wave. However, he didn’t stop there. Follow the jump to read more.